Owners who have further questions are asked to visit www.toyota.com or www.lexus.com or contact the Toyota Customer Experience Center at 1-800-331-4331 or Lexus Customer Assistance at 1-800-255-3987. NOTE TO CONSUMERS: We’ve received a number of comments and questions about the floor mat issue and understand the safety concerns. We want to be responsive, but the Toyota USA Newsroom is not intended as a place for consumer complaints, or detailed information about any vehicle features, specs or capabilities. These types of concerns are best handled by our Customer Experience Center where they will be routed to the appropriate customer service representative for Toyota, Scion or Lexus. You can reach our customer service representatives by calling 1-800-331-4331. Prefer to email or chat? 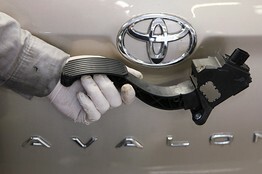 Simply access our website email or live chat links for Toyota, Scion or Lexus.